Donald Glover’s Golden Globe-winning Atlanta, for my money, was the funniest and driest comedy on TV in 2016. It had heart, it probed into its characters’ interiors with uncommon insight, it sprinkled about surreal touches. (“It’s free chicken sandwich day.”) Most of its 10 episodes clocked in around 22 minutes, which meant that it left its devotees wanting more—a rare thing for a medium in which story lines are regularly stretched out to fill the time they’ve been allotted for a season. Donald is a remarkable artist, effortlessly shifting from actor to writer, producer, director and musician to create one amazing project after another. 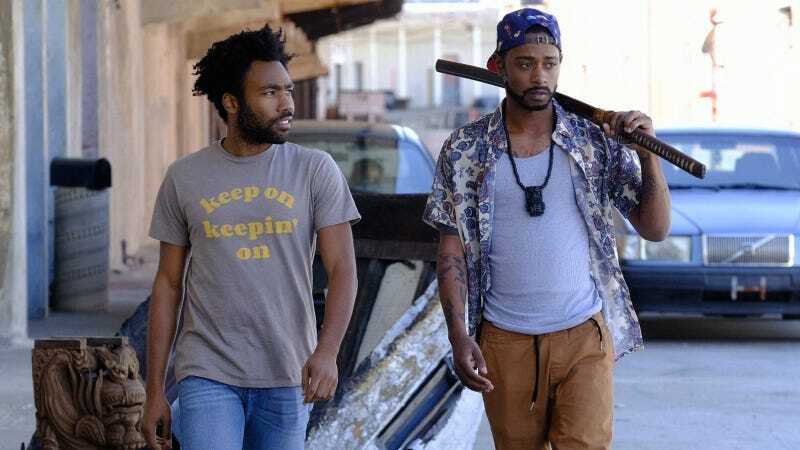 Atlanta was just the beginning, the breakout comedy of the year and a series revered as much for its originality as its honest look at the experience of being aspiring, young and black in that legendary city. We’re proud to partner with Donald in an overall deal that will allow him to continue turning his creative vision into incredible television. Yeah yeah, but we could all be dead by the time Atlanta returns for Season 2. Sad! I was just wondering, could I measure your tree?